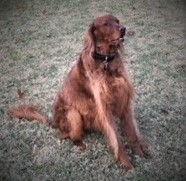 Major, our beautiful and loving Irish Sitter, has one daunting health issue. Many “allergies” to grass and airborne pollen creating sore oozing foot pads. After lengthy efforts to cure Major with external treatments, he received complete allergy testing and a combination of medications including oral mouth drops from Dr. Gimmler of the Animal Dermatology Clinic in Grapevine.